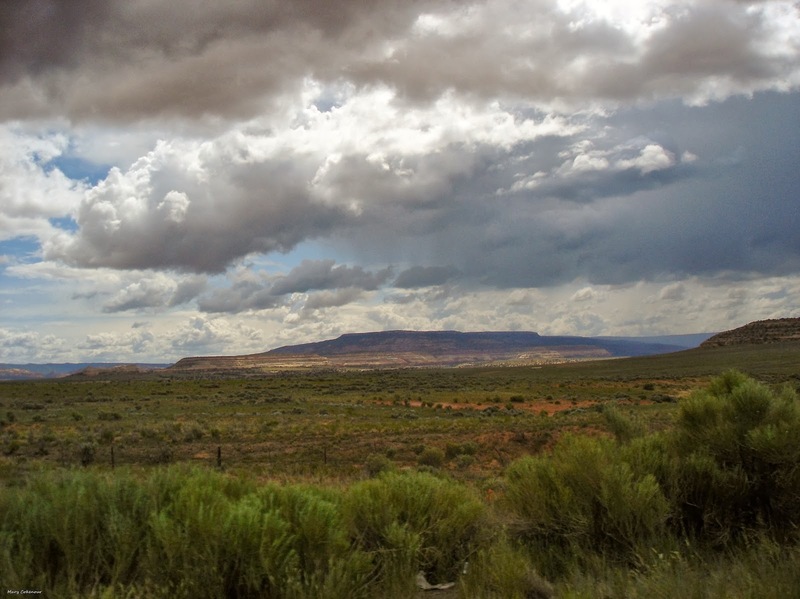 The Southwest Through Wide Brown Eyes: Weather in the Desert is a Rollercoaster Ride. Looking out the window, piles of snow everywhere and thanking Mother Nature for bringing us out of below zero temperatures into the 30s; I have to laugh at some of the questions and/or comments I hear about the desert. One favorite is, "It can't snow in the desert, it's a desert!" Surprise, this area of the United States has four seasons just like any other area, just not of text book accuracy. The desert located in Southeastern Utah does have average yearly temperatures, but don't treat them as gospel. Average means they do go high, but they go quite low as well; for example, on Tuesday morning (December 10, 2013) the outdoor thermometer was at 16 below (16F below zero). Now you might think that is average, since Monticello is 7100 feet above sea level, with the Abajo Mountains as our background. Traveling down Route 491 towards Cortez, Colorado; descending to about 5000 feet above sea level, surrounded by desert sand and sagebrush; the temperature was a zippy 5 below zero. I can truthfully tell you that this year, our fall into winter weather is not average at all. Folks traveling through here during the Thanksgiving holiday week and weekend were certainly thrown for a loop; dense cloud cover had descended to meet the frosty air coming off the snow on the desert. Talk about riding the clouds, we were living inside them! When it comes to crisp clean skies, we have them; Salt Lake City's dense salt lake, over congested city and suburbs which run directly into other surrounding cities create highly polluted and discolored skies. Simply seems to be the norm for large cities though, doesn't it? When I first visited the Four Corners area and saw those skies of bluest blue, my breath was taken away in pure amazement. The clouds, when they happen by, are glistening white and whispy; but when a storm is brewing, they come in darkest immensity. Rainstorms can be 5 minutes to 5 hours, they follow no rule; thunder and lightning storms are so intense, you swear you can feel the house shake. Rainbows are huge, looking to stretch from one county to another, but it's the double rainbows that stop you in your tracks in awe. During the daylight hours, the moon keeps its presence in the sky. I love this series of shots I'm about to post; I have no idea what it was, but it looked as if the object just missed hitting the moon. During the warmer months, our sunsets are intense; golden hues of a red, yellow and orange mixture silhouetting sandstone hills and formations. In the colder months, pink sunsets with red undertones highlight the western skies; talk about breath taking! The weather in the desert is not what you expect from reading about it in a book, or online; the weather is always changing and always dramatic in some form.